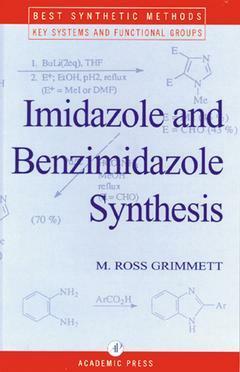 Imidazole and Benzimidazole Synthesis Grimmett M. R.
Directors of collection: Meth-Cohn O., Katritzky Alan R.
Add to cart the livre of Grimmett M. R.
Imidazole and Benzimidazole Synthesis is a comprehensive survey of the known methods of syntheses and ring modification. It brings together the multitude of synthesis of the imidazole ring in a systemic way interms of specific bond formation, and recommends the most attractive synthetic approaches. It also collects non-ring-synthetic approaches to classes of compounds such as nitro-, halogeno-, and amino-imidazoles, and covers the synthesis of N-substituted compounds and preparations of specific isomers. Introduction. Ring Synthesis by Formation of One Bond. Ring Synthesis Involving Formation of Two Bonds: [4+1] Fragments. Ring Synthesis Involving Formation of Two Bonds: [3+2] Fragments. Ring Synthesis Which Involve Formation of Three or Four Bonds. Syntheses from Other Heterocycles. Aromatic Substitution Approaches to Synthesis. Syntheses of Specifically Substituted Imidazoles and Benzimidazoles. Appendix, Abbreviations and Acronyms. Index to Detailed Syntheses. Subject Index. Audience: Synthetic chemists in academia and industry. M. Ross Grimmett was born in Dunedin, New Zealand, and he was educated at Otago and Massay Universities in New Zealand. His major research interests have been agolo allagladions and studies of nucleophilic substitution.